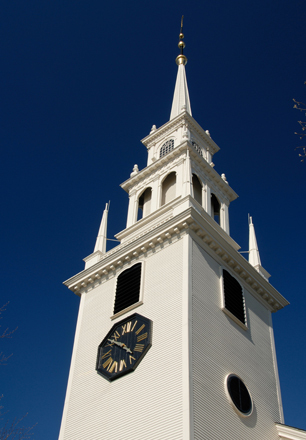 Trinity Church (1726), Newport, Rhode Island; Detail of tower. 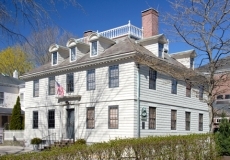 Vernon House (1760), Newport, Rhode Island. 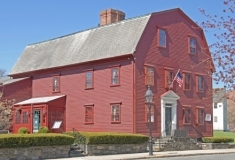 American Revolutionary War residence of Comte de Rochambeau. Exterior fully rusticated wood to appear like stone, hipped roof, balustrade, Doric entablature. 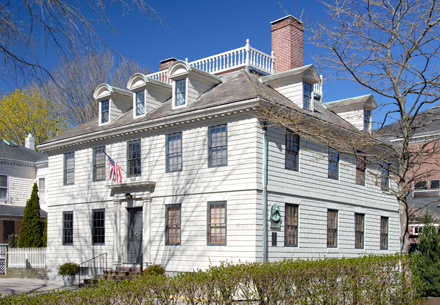 Wanton-Lyman-Hazard House (c1697), Newport, Rhode Island. 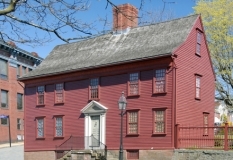 Reputedly the oldest surviving Newport house. The owner in 1765 was chased out during the Stamp Act Riots. Pilastered center chimney, two-slope roof, angular pediment. White Horse Tavern (late 17th century), Newport, Rhode Island; showing gambrel roof added in late 18th century. The tavern served many functions. The colony assembly, criminal court and city council met here prior to the construction of Colony House. Today it functions as a restaurant with a strong colonial atmosphere. Newport, Rhode Island from Fort Adams. 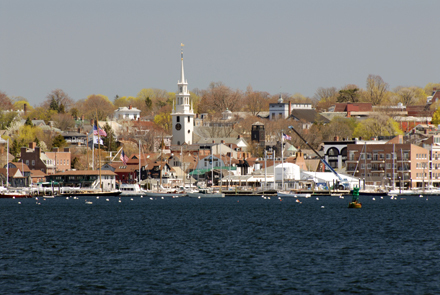 The harbor on a windy spring day showing the tower of Trinity Church.